(Vatican Radio) Pope Francis on Thursday morning paid a private visit to the Basilica of Saint Mary Major in Rome, where – as has become customary – he prayed before the icon of Maria Salus Populi Romani ahead of his Apostolic Voyage to Mexico. From St Mary Major, the Holy Father made the short journey to Rom’s Cathedral, the Archbasilica of St John Lateran, where the priests of the diocese were meeting at the beginning of Lent. During the visit, Pope Francis heard the confessions of several priests. As a Lenten “sign,” the offering taken up during the encounter was donated to the diocesan branch of Caritas. The full text of Chirovsky’s essay follows. -- 7:45 a.m. (1:45 a.m.) Departure from Rome's Fiumicino airport. -- 2 p.m. Arrival at Jose Marti International Airport in Havana. -- 2:15 p.m. Private meeting with Patriarch Kirill. -- 4:30 p.m. Signing of a joint declaration. Speeches by patriarch and by pope. -- 5:30 p.m. Departure from Havana airport for Mexico City. -- 7:30 p.m. (8:30 p.m.) Arrival at Benito Juarez International Airport in Mexico City. Officials to greet pope. His Holiness Pope Francis meets with His Holiness Patriarch Kirill of Moscow and All Russia in Cuba, where the Pope makes a stop on his way to Mexico, and where the Patriarch is on an official visit. The meeting includes a personal conversation at Havana’s José Martí International Airport, and concludes with the signing of a joint declaration. (Vatican Radio) Pope Francis greeted the reporters who joined him on the plane Friday for his apostolic journey to Havana – for a brief meeting with Russian Patriarch Kirill – and Mexico. Father Lombardi said the Pope noted it was the final apostolic trip of Alberto Gasbarri, the coordinator of papal journeys, and thanked him for his 47 years of service to the Vatican. Vatican Radio) Pope Francis has just arrived in the Cuban capital Havana where he will have an historic first meeting with the leader of the Russian Orthodox Church, Patriarch Kirill. The Patriarch arrived in Cuba yesterday at the start of a three nation tour of Orthodox communities in Latin America, while Pope Francis is on his way to Mexico City, where he’s scheduled to land at around 7.30 this evening local time. Cuban President Raul Castro was at Havana’s ‘José Martì’ International airport to meet the papal plane and to accompany Pope Francis to the room where the private encounter is taking place. Pope Francis and Patriarch Kirill greet each other..
First question Patriarch asks Pope: "How was your flight?" Pope: "It was very good." 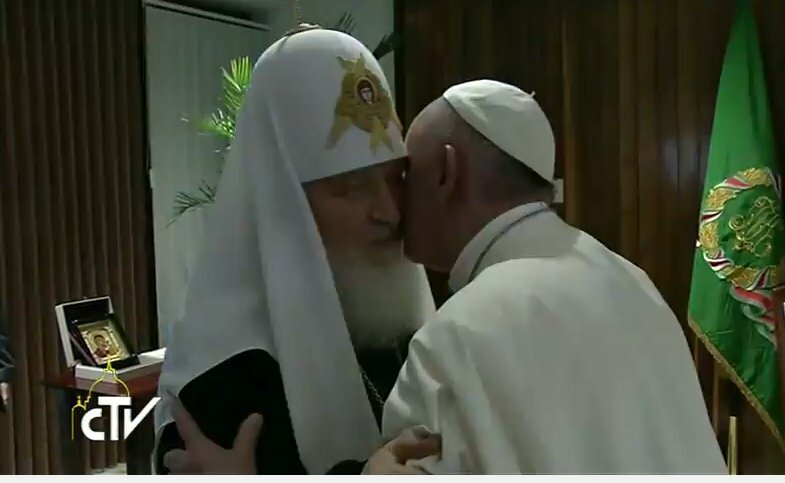 At long last, Pope Francis and Russian Orthodox Patriarch Kirill of Moscow have embraced, kissing each other three times. “Finally,” the Pope told the Patriarch as they met in a lounge at Havana’s José Martí International Airport . “We are brothers,” he told the Patriarch. Cuban President Raúl Castro played host to the pope and patriarch, who was on a visit to Russian Orthodox communities on the island-nation. Pope Francis had a pastoral visit to Mexico planned for months; the stop in Havana was announced only a week before the meeting. The addition of a stopover in Cuba was widely seen as a sign of Pope Francis’s willingness to go the extra mile to reach out a hand in friendship. At the same time, observers said, it gave those Russian Orthodox opposed to ecumenism a sense that their church is special and that it bowed to no one in agreeing to the meeting. 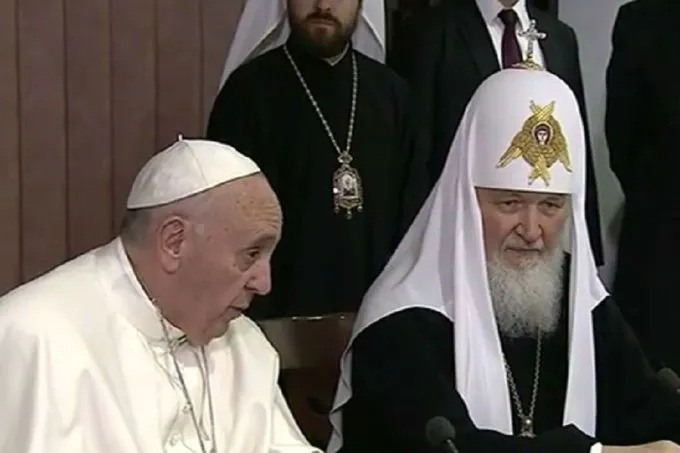 For decades, the Russian Orthodox told the Vatican that a meeting between the patriarch and pope was impossible because of the activities of Latin Rite Catholics in Russia and, especially, the Eastern Rite Catholics in Ukraine. Pope Francis arrived Friday night on his first trip as pontiff to the overwhelmingly Roman Catholic country of Mexico, following a historic meeting in Cuba with the leader of the Russian Orthodox Church and looking ahead to a pointed and problematic mission. Mexican President Enrique Peña Nieto and his wife, Angelica Rivera, greeted the pope, surrounded by mariachis and festively dressed dancers singing the Mexican classic "Cielito Lindo." "Queremos su bendicion!" the crowd shouted: "We want your blessing!" It is the fourth trip as pope to the Americas for the Argentine native, the first pontiff born in the Americas. Arriving at Benito Juarez International Airport at 7:30 p.m., the pope confronted an extraordinary Mexican spectacle: a full mariachi band, complete with men decked out in charro outfits and women dancers in white blouses and red skirts. Many in the delirious audience of about 5,000 displayed the lights of their cellular phones, while also waving handkerchiefs of green, white and red, the colors of the Mexican flag. Dancers on hand at the airport moved to a number of well-known Mexican songs, including “Jarabe Tapatio,” a traditional dance tune from the northern state of Jalisco. Enjoying the show from the red carpet, the pope applauded the performers. 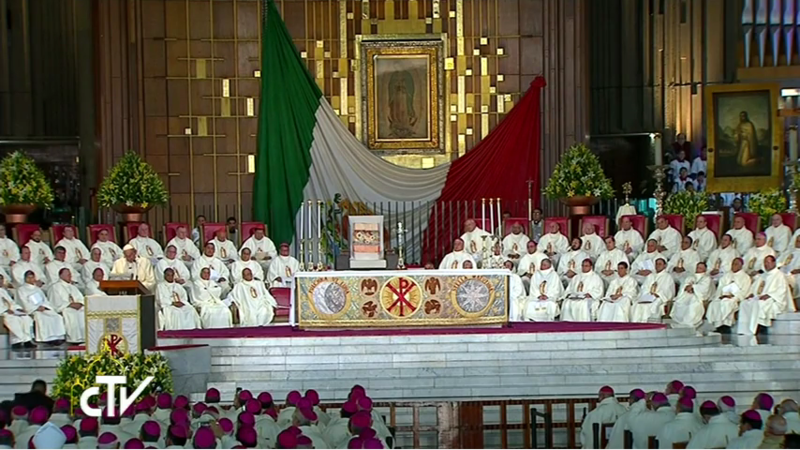 Pope Francis in Mexico: Welcoming ceremony at the National Palace. Courtesy visit with the President of the Republic. Mexico City -- Pope Francis has given one of his most direct and blunt outlines for what he expects from Catholic bishops, forcefully telling the Mexican episcopacy what they should and should not be doing -- warning them against words that are "empty figures of speech" and inaction that "squanders" their country's history. (Vatican Radio) Pope Francis addressed the Catholic Bishops of Mexico on Saturday, the first full day of his Apostolic visit to the country. Below, please find the full text of the Holy Father's prepared remarks, in their official English translation. (Vatican Radio) On the first full day of his visit to Mexico, Pope Francis, celebrated Mass at the Basilica of Guadalupe in Mexico City.The shrine of the Virgin of Guadalupe, is the most visited Catholic pilgrimage site in the world and one that is particularly important to the first Latin American pope. During his homily, drawing inspiration from the episode of the visitation of the Virgin Mary to her cousin Elizabeth, the Holy Father stressed on the “yes” of Mary’s surrender to God which prompted her to give the best of herself, going forth to meet the others. Juan who considered himself lowly and unworthy, experienced in his own life what hope is, what the mercy of God is. He was called to build a shrine and the Pope emphasized that the shrines that they were called to build are the poor and the oppressed. Assuring solace of the presence of Our Lady in the lives of the Poor and suffering, the Pope said “Mary tells us that she has ‘the honour’ of being our mother, assuring us that those who suffer do not weep in vain. Below please find the full text of the official English translation of the Holy Father's Homily. 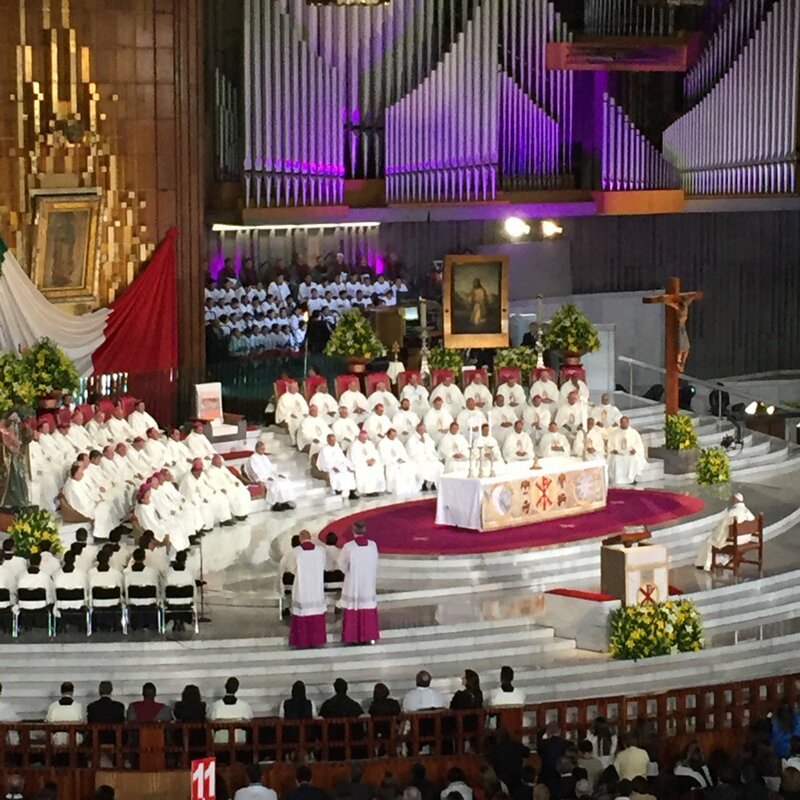 (Vatican Radio) At the conclusion of Holy Mass at the Basilica of Our Lady of Guadalupe, Pope Francis led the faithful in the Rite of Coronation of the image of the Most Holy Virgin of Guadalupe. The miraculous image dates back to 1531, when the Blessed Virgin Mary appeared to St Juan Diego Cuauhtlatoatzin. Since that time, the Virgin, under the title of Our Lady of Guadalupe, has been proclaimed Patroness of Mexico, Patroness and Empress of the Americas, and Heavenly Patroness of the Philippines. She is also known as the Protectress of Unborn Children.The Shrine of Our Lady of Guadalupe is one of the most visited pilgrimmage places in the world, with millions of pilgrims coming each year to venerate the sacred image.